Save yourself both money and time by reserving your airport parking at Edinburgh Airport (airport code EDI) before your next trip. There are five Edinburgh airport parking lots to choose from. Two of the lots are off-airport grounds, but both offer a transfer shuttle service to get you to the terminal. The two off-airport lots are “Secure Airparks” and “Park & Fly.” Another other lot available to you is the ultimate in stress-free service – it is “Secure Airparks Meet & Greet,” and it is essentially valet parking at the airport. You simply drive up to the terminal and a driver meets you there. Then you hand over the keys and the driver takes your car to its appointed parking space while you go get yourself checked in for your flight! 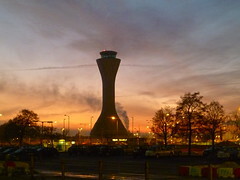 Edinburgh Airport lies roughly eight miles from downtown Edinburgh, which is Scotland’s capital city. While Edinburgh is not a hub airport for any airline, there are several major and low-cost airlines which fly to and from the city. The airlines which serve the most cities are Flyglobespan, easyJet and Flybe. Scotland’s largest airport at the moment is in Glasgow, but the Edinburgh Airport is planning to expand which could help it become the largest Scottish airport. WiFi is available, for a fee. For traffic information, see Edinburgh Council traffic site here. Taxi: There are three places to catch taxis at the airport, and the trip between the city center and the airport takes roughly 25 minutes. Bus/Shuttle: The Airlink Express bus service connects central Edinburgh with the airport, as does the regular local Lothian bus #35. The Airlink Express is much faster between the city and the airport, but the Lothian bus is cheaper.